Ever-changing moving company regulations can have a significant impact on your operations. Oversight and guidelines vary from state to state, and the difference between doing business in one state and another can be considerable. Moreover, if your business expands into interstate moves, you will be required to adhere to the regulations of any new jurisdiction you move into. The Federal Motor Carrier Safety Administration governs moving regulations in all 50 states and US territories. As a division of the Department of Transportation (DoT), the agency helps protect consumers from “rogue operators” who deliver shoddy services at steep rates. To help protect both consumers and reputable companies, the DoT requires movers to provide consumers with detailed statements that show precisely how much the moving services will cost, as well as the conditions via which the services will be provided. Moreover, the Surface Transportation Board requires movers to carry liability coverage that covers the goods being transported. Of course, the rates for this coverage change based on any cost of living adjustments made by the Department of Commerce. As these costs increase, so too does the cost of carrying insurance that covers consumer goods. Regulations and the responsible regulatory agency vary considerably from state to state. In some states, movers are regulated by the Department of Weights and Measures or the Department of Transportation, while in others it is the Public Utilities Commission or the Department of Public Safety. 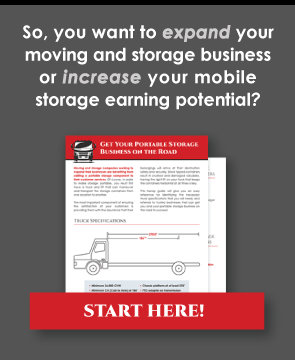 This can create significant headaches for any mobile storage operator or moving company whose sights are set into expanding across state lines. Doing so requires first determining the responsible agency, and then determining the most efficient and cost-effective options for bringing your company into compliance with their regulations. All of this takes time and money. In fact, the wisest move for moving companies pondering such a move is to hire a lawyer who has knowledge and experience within the intended market. A knowledgeable attorney is an expense that is worth their weight in gold. It is not uncommon for clients to neglect to inform moving companies that they are transporting hazardous cargo. Ammunition, fuel, compressed gasses, cleaning agents, etc. can pose a significant risk of fire or explosion. Moving companies that transport these dangerous goods without the proper documentation can be subject to stiff fines and penalties. Moreover, when companies violate moving company regulations in this regard, they can have their license suspended or be denied the ability to transport future shipments into the state where the violation occurred. The best way to handle regulatory change is to get active with the trade associations and lobbying efforts related to the moving industry. When you do this, you have an active say in the future of moving company regulations. The louder your voice, the more impact you will have in shaping the future of the industry. Being active takes time, but the effort you put forth can have a significant influence on the future of your business. In addition to taking an active role in the future of the industry, it’s crucial that your clients can depend on your company and your representatives for reliable and up-to-date information regarding existing regulations and rules. Ultimately, the more time you spend training your teams to keep everything between the lines, the less time you will spend fielding complaints and putting out brush fires along the way.